Home — All Essay Examples — Law Essay, Sociology Essay — Are we really all equal? Are we really all equal? Is there a place for ubuntu in society? The term ubuntu comes from an ancient African term that means â€œhumanity to othersâ€. Thereâ€™s no specific term that defines exactly what ubuntu is but some of the principles tells us more about this ideology. Some of these principles are: respect, caring and unselfishness. The question was asked if there is a place for ubuntu in society, but I want to make a statement, what would society be without ubuntu? A clear example of ubuntu is our former president Nelson Mandela. When democracy came into affect our country became one, and that is what ubuntu is all about. Without ubuntu there would be war, hatred and selfishness. We need the spirit of ubuntu in our society in order to build high and powerful organisations. Our community does not know how to enforce this new term called ubuntu and in order for our country to be one, the inequality should STOP. Success depends on ubuntu, it is a concept to strive for. ubuntu has its own place in our society. It is necessary, but this change is a process not an event. According to Scharges (2015) humans are connected whether it is socially, politically or otherwise and our actions affect each other. Our actions have consequences on one another. As Desmond Tutu (1999) said: â€œA person is a person trough other personsâ€. How would our society improve with the spirit of ubuntu? As people we do not realise that we are already contributing to ubuntu and improving society. When South Africa became a democratic alliance ubuntu came a new term to our country. As I said earlier, ubuntu means that we are one. As the next generation the community must stand together to build a brighter future for our country. If the community use the spirit of ubuntu South Africa would be a better place. Crime would stop, we would have more respect for one another and society will be peaceful. Discrimination would decrease and people would be able to work together and achieve what South Africa is supposed to be. If citizens would stop discriminating, treat everyone as equal and stand together, ubuntu will become part of our everyday lives. Everyone should feel important, be treated with respect and dignity. Has ubuntu influenced our legal system? South Africa is a multicultural society indigenous law is not featured in the main stream of jurisprudence in South Africa. Some aspects of ubuntu are universally applied and play a key role. According to Bennett (as indicated by Bennett, 2011:14) when South Africa became a democratic society the concept of ubuntu was adopted in the general law of the country. In the case s v Makwanyane, ubuntu made its debut in jurisprudence of the Constitutional court. Ubuntu became an integral part of the constitutional values and principles in the interpretation of the Bill of Rights and other areas of law. Ubuntu is inherent to customary law. Ubuntu is part of the transformation of our South African law. It serves as a basis which the bill of rights could be interpreted. After a close look at what my peers said, I assessed every argument. My fellow students definitely got me thinking. My fellow student said that wealth and status determine your standing in the law and I agree. We are a democratic society but there is still corruption, politics and discrimination. Now I come to the point where I disagree. While South Africa tries to enforce equality our country in reality are not yet equal. As I said previously that equality is defined as everyone to have the same status. I strongly disagree with the statement Mdledle (2015) â€œobjective consideration of all classesâ€. B. Levins statement comes into mind. Wealth and status determine your standing in law. Our country is far from just. The law tries to achieve equality by enforcing the Broad-Based Black Economic Empowerment 2003 (Act no. 53 of 2003). It brings me to the next point where I disagree with L. Davies. South Africa is a new democratic country and there are a lot of changes that needs to happen. For instance, ubuntu is not applied by all South Africans. I would definitely support the saying that South Africa is a young democracy. (21 years of democracy). Ubuntu does promote tolerance and acceptance but if ubuntu is not enforced by the people our country cannot implement ubuntu- acceptance and tolerance. I strongly disagree with B. Levin on the matter of human life. There are a lot of people that does not enforce the spirit of ubuntu BUT it does not give anyone the power to say they are no value for human life. Ubuntu clearly states that the community are one, we must stand as one, be kind, unselfish and caring. According to the constitution (1996) section 2(11) everyone has the right to life. The constitution (1996) section 2(10) also states that everyone has their inherent dignity and their dignity respected and protected. B. Levin does have a point when he said the communityâ€™s rights are not enforced when a person is not getting medical treatment what they are entitled to. Showing people away when they need help does not promote democracy and in this matter ubuntu. The National Health Act no 61 of 2003 states that everyone has the right to medical treatment. The last comment I want to point out is the statement about the past. I disagree. Before there was democracy, apartheid existed. Apartheid is an Afrikaans word that means apartness. The word does not mean discrimination or inequality. Black people were not treated fairly in this time but one cannot make the statement by saying â€œviolent pastâ€™. My reason is that, if you look at the present violence is still not resolved. 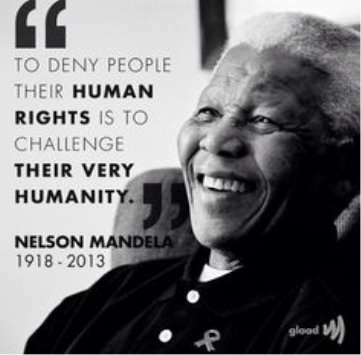 Human rights were violated in the past but so are they today, maybe not in the same way but the concept stay the same. Ubuntu cannot take its course because the past makes it difficult but it is no reason for the youth of today to not apply ubuntu. Acts like the Broad-Based Black Economic Empowerment Act no 53 of 2003 are made to balance the gap of inequalities. Ubuntu is already part of our lives because the word democracy says it all. All of my fellow studentâ€™s arguments got me thinking. Some of them had valid points even if I donâ€™t agree with them. As the leader Steve Biko said (1970:46): â€œthe great powers of the world may have done wonders in giving the world an industrial and military look, but the great still has to come from Africa- giving the world a more human faceâ€. Bibliography Oxford dictionary. 2015. Equal. http://www.oxforddictionaries.com/definition/english/equal 2015-02-19 South Africa Parliament of the Republic of South Africa. 2015. Our constitution. Cape town South Africa. 1996 Constitution of the Republic of South Africa. 1996 Scharges, J. 2015. uBuntu?. http://www.capetownmagazine.com/whats-the-deal-with/ubuntu/125_22_17348 2015-02-21 Bennett, Tw. 2011. Ubuntu: An African equity.